Bionic augmentations could be the next big rideable thing. 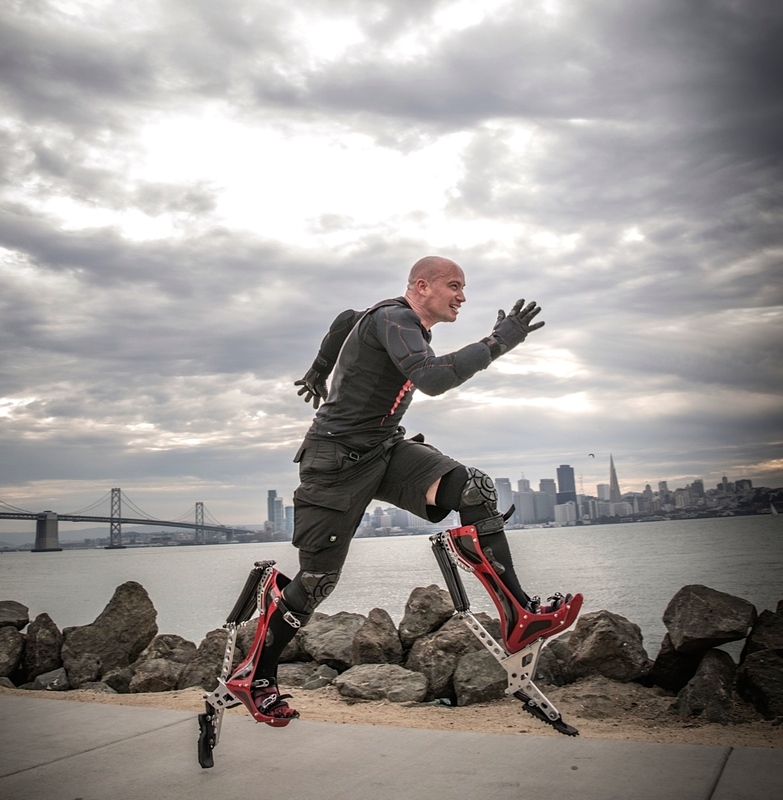 Engineer Keahi Seymour spent a recent weekend running laps around a San Francisco warehouse, but instead of Nikes, he was strapped into bionic boots of his own creation. Seymour was there to show attendees of Worlds Fair Nano, a futurist convention — slogan: “the future will be epic” — what exactly his boots could do. The Bionic Boots were one of the many different rideable technologies showcased at the expo, but what made them stand out from the various motorized skateboards and “hoverboards” was that instead of being steered or driven, the Bionic Boots are strapped onto a person’s legs, augmenting their normal ability to Olympian levels. Seymour says the Bionic Boots have a max speed of 25 mph (Usain Bolt’s record land speed is 27 mph), and that’s only this first version. He says their “cruising speed” is around 15 mph, or what you’d average on a bicycle. Inverse had to know more about these boots, so we asked Seymour. Keahi Seymour and his Bionic Boot at the Worlds Fair Nano in San Francisco. What inspired the Bionic Boots? So the inspiration for the Bionic Boots came from initially watching an animal TV program. I looked to the ostrich, which is one of the fastest bipedal animals on Earth, and the ways I could try and make a human run faster. So I wanted to take inspiration from the ostrich and how it stores elastic energy in its Achilles tendons, which inspired the design of the Bionic Boots. You’ve said the Bionic Boot could appeal to the extreme sports crowd. 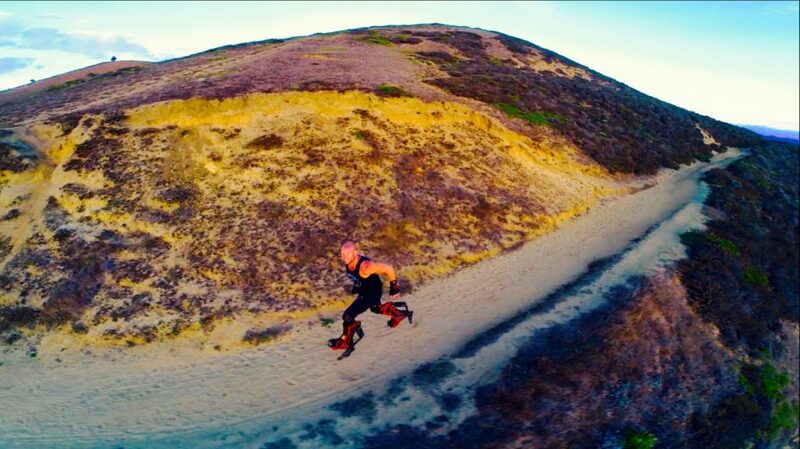 Ideally, I’d like to market the Bionic Boots to a wider market, not only just the extreme sports crowd. Initially, it will be geared toward them, but I basically want the general public to use them. Not only is it a form of extreme sports or recreation, it’s a form of personal transportation, recreation, and a low-impact fitness device. While we have these very different devices around us in terms of urban transportation, the bionic boot has the advantage over other rideable devices because you can go through traffic and go over any terrain, jump up on curbs, and you can walk straight into work without having to lock up your bike or park your car. I imagine that you must have fallen at least once while testing the Bionic Boots. How do you get back up on those? There’s actually no trouble getting up after falling. How much will the Bionic Boots cost? That’s the million-dollar question that everyone wants to know. Initially, it will have to be higher priced, like a high-end mountain bike. That’s because it uses specific aircraft grade aluminum, titanium, and carbon fiber. I will also eventually want to have different price-point versions: A high-end version, a medium-priced version, and a lower-priced version, all using different materials. And when do you expect the Bionic Boots to launch? I would like it out as soon as possible, but I’m looking for a manufacturer to get it out quicker. I’m currently making every piece of the boot myself, there are going to be custom versions. If I get a manufacturer, we can get it to the public quicker.